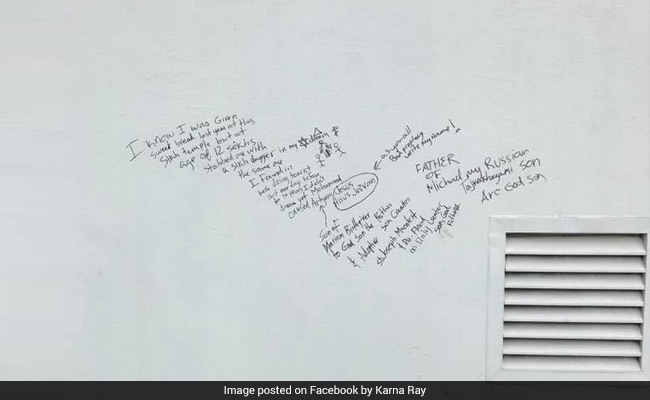 Artyom Manukyan, 27, is accused of using a black marker to write hate messages on the walls of the Vermont Gurdwara, also known as the Hollywood Sikh Temple, on August 31, Capt. There were hateful messages written on the walls of the Gurdwara. Washington: The police have identified a suspect who had vandalised a Gurdwara with hate messages and threatened to slit the throat of a witness who caught the incident on video in the US state of California. Robert Long of the Los Angeles Police Department's Major Crimes Division was quoted as saying by the Los Angeles Times. Mr Long said the suspect was confronted by several people, including a man who filmed the incident and posted it on Facebook. The man followed Manukyan for several blocks before the suspect threatened him with a straight razor, police said. In the video, a man police identified as Manukyan can be seen calmly walking away from the wall and ignoring someone who repeatedly shouts, "Why did you write on it?" Manukyan, who lives in the Glendale or Los Angeles area, has been arrested on suspicion of burglary, grand theft auto and making criminal threats in the past, Mr Long said. At a news conference on Monday, police asked for the public's help in locating Manukyan after a weeks-long search failed to result in an arrest. The messages are still visible on the Vermont Avenue side of the Gurdwara. One reads, "Nuke death...Sikhs," with a profanity in between, while the other refers to a group of Sikhs stabbing the author when he was a child. Mr Long said Manukyan's family has been cooperative, but the suspect's motives remain unclear. Manukyan was not known to the Gurdwara's community, said Nirinjan Singh Khalsa, executive director of the California Sikh Council. "I am fully confident he designed this as a threat to the Sikh community and we need to take him into custody to make sure that the community, not just the Sikh community, but the community as a whole, is safer," Mr Long said. If arrested, Manukyan could face vandalism charges with a hate crime enhancement, Mr Long said. He would also face criminal threats charges for brandishing a blade at the man who filmed him, according to Mr Long, who said the case has been presented to the Los Angeles County District Attorney's Office. Mr Long said the suspect may be mentally ill, but it is not clear if he has been formally diagnosed, the paper reported. Mr Khalsa said he believes that attacks on the Sikh community have increased recently as well. "I can tell you on behalf of the Sikh community that these incidents are up, especially in the political climate we're in now. In the past hate crimes against Sikhs were mistaken identity hate crimes," he said. "Unfortunately, now what we're seeing is Sikhs are part of the other group in the mind of some people that think hatred is patriotic," he added.